I just wanted to take a moment to introduce you to a friend of mine. We were high school chums and we used to get up to all sorts of mischief together. One of the more wholesome activities we used to indulge in was jewellery making. While I still dabble here and there with stringing beads and so forth, Karen has gone on to create KAZAM designs. 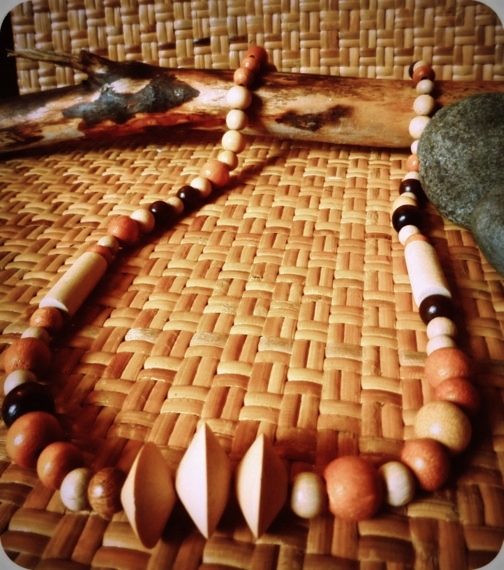 She devotes her days to creating one-of-a-kind adornments, fashioned from natural elements such as wood and stone, and recycled bits and bobs from vintage finds. While we both grew up in Australia, Kaz is currently chasing cows around in paddocks in the Scottish highlands with her brand new husband! She is new to the blog world so she is offering a give-away as a way of introducing herself and her wares. You can check it out here. Kaz also designs/makes stencilled trucker caps and canvas work. Her whole aesthetic is a mishmash of street/beach/hippy/boho/skatr style. Eclectic! Yes, she always was. That was why we were such good friends. Kaz has never been afraid to walk to the beat of her own drum.